When my husband came home to tell me he had received orders for a year-long unaccompanied tour to Korea, I remember thinking how different life would be. I didn’t expect just how different. He had only been an active duty chaplain for three years and we were still at our first duty station. We had established a good routine and had a great supportive community. I had grown up as a military kid, so not having a “home town,” we decided that I should stay at our current location with our two children. Our oldest was five and our youngest turned two, three days before my husband left. My husband had been the chaplain over the contemporary service for the three years he was there and it grew to be a very tight community. The people attending were consistent and willing to serve. However, it didn’t take long for that to go away. The transition to a new chaplain was hard for people, and for me. Slowly, people started finding churches off-base and I finally made the decision to go elsewhere as well. So not only did I lose my husband, and my children their father, we lost our pastor and our church community. It was a very lonely place to be. Our new church was wonderful and welcoming and understanding of our situation, but it was small and a bit of a distance away. And for me, who was getting used to being a single parent, it was hard to get plugged in. We lived on base, and our community was great. It was surprisingly filled with fellow believers. We had different denominations we associated with, but our foundations were similar. In the beginning, people were very kind and thoughtful. But, after about three months, they kind of forgot about us. So while my community was always supportive and willing to help in any way possible, it wasn’t always inviting. Not to say they were rude, it was quite the opposite, but I found myself being more of an outcast. I do not think this was new. I probably always was kind of an outcast. I was surrounded by pilot wives. I was not in their “group.” I did not always understand the language they spoke in terms of their husbands’ jobs. But I always had my husband to talk with at the end of the night. We went out on dates and I could “get away” if I needed a break. Well, that was no more. I found myself, on most nights, tired and overwhelmed, looking on Facebook at all the things the people around me were doing with each other–but not with me. Our houses were very close together, making our lives pretty transparent. Sharing fences, and windows and doors often being open, we heard and saw real life. My neighbors on most Friday nights would have people over. I remember one particular night seeing four other families being invited over, their children having a blast together and the parents enjoying conversations while my kids and I sat in silence eating our frozen pizza. I didn’t understand. Why was I left out so often? I started seeing this pattern more and more. People would say encouraging words, would invite the kids and me over for dinner (usually no one else would be invited), and would say we need to do it again. But then they would have a birthday party for their kid and invite everyone else in the neighborhood except us. I remember talking to my husband on FaceTime in tears, just asking him, “What’s wrong with me? Why don’t people like me?” He, of course, was encouraging, but at the end of the night, I was alone with my thoughts. So I started thinking, maybe God is trying to teach me something. Maybe there is something wrong with me. Maybe I’m too vocal with opinions, or joke around too much. I decided I would start being less like myself and try to work on things. But when I started doing this, people would ask me, “What’s wrong? I’ve noticed you’ve been different.” All this just brought confusion for me. I didn’t want to tell them what was going on, so I always simply said it was personal. After a few months, I started noticing something. When I was invited to a Chick-fil-A playdate or I randomly ran into a few people on the street and we started talking, there was something that always seemed to happen. One of them would use bad language, immediately look at me and say, “I’m sorry,” and keep going. I always found this a little odd. I never directly said, “Please don’t use that language around me.” They just assumed I wouldn’t appreciate it. They were right, but I never said anything. I noticed it more and more. Even around different groups, I could tell they were more cautious with their words–start to say one word, pause, and use a different word. It finally hit me. Maybe there was nothing wrong with me. 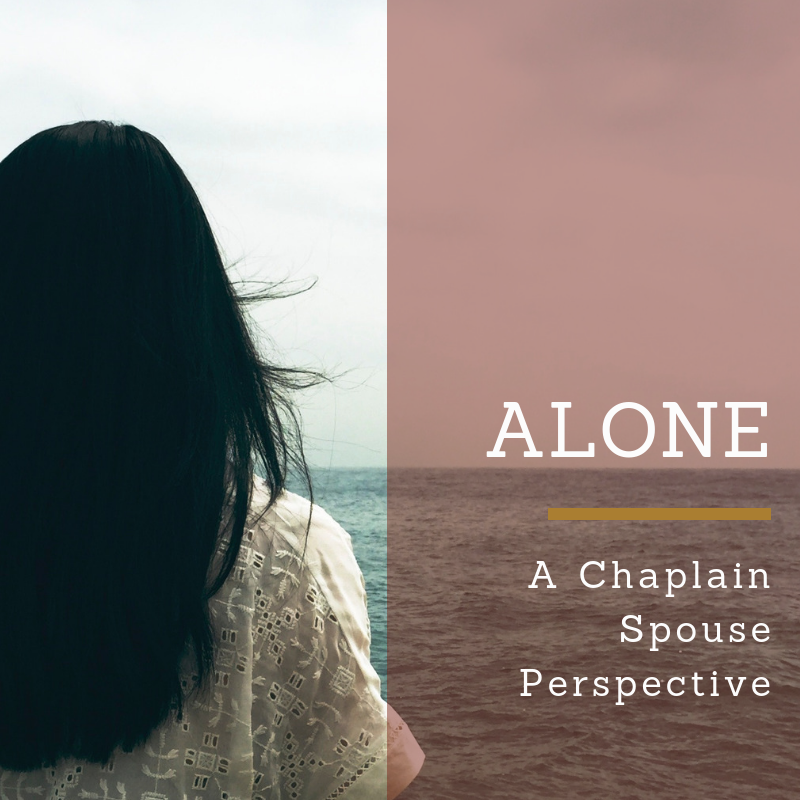 I was simply a chaplain’s wife. Now, I know not all chaplains’ wives are the same. We each have our own convictions and struggles. I know that not everyone’s personalities mesh well together, and some of these people may have had a problem with just me. But the simple fact was, when I was around, they weren’t acting the way they usually did. I never told them my convictions, they simply assumed what they were because of my husband’s job. After this “ah ha” moment came, I then had to start asking myself if I was ok with being an outcast. Was I ok not being part of a “tribe”? I wasn’t going to change the values I had because I might be invited to more birthday parties. And I didn’t want them to feel they couldn’t be themselves with me being around. I just had to be ok with being alone sometimes. Ok with seeing others go out together having fun while I sat binge watching Netflix. In the end, it should never have been about me. It should have been about God. Once I finally came to that realization, and I took the focus off of me, I no longer felt alone. Free to go out and be who I was, and to show others who I really was. I decided that even if I was ok with being an outcast, I was going to try and not be one. At least on my end. I started inviting families over for dinner more and letting them see my real life. Making more of an effort to go out and let others in. I think people started seeing that even if we had different convictions, we had more in common than not. Towards the end of the tour, I felt more a part of things. Looking back now, however, I don’t think much changed around me. Instead, I had changed. I had a different outlook on life. My convictions and values were a part of me, but that didn’t mean I needed to sit and be lonely because others didn’t share them. I needed to go out and make myself available. I needed to invite instead of waiting for an invitation. The Lord definitely sanctified me in ways I never thought possible during that year. The fact remains that my husband loves being a chaplain, and I love being his wife. I will proudly wear the title “chaplain’s wife” no matter what assumptions come with it. Because, let’s face it, assumptions will be made about us no matter what our husbands do. Let’s get out there and invite people in before too many of those assumptions can be made.